Reba McEntire will release her new 12-track project, Love Somebody, on April 14. The project will feature songs from writers including Brandy Clark, Rhett Akins, Ben Hayslip, Shane McAnally, Sam Hunt, Liz Hengber, Tom Douglas, and more. 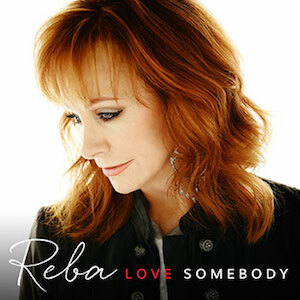 Love Somebody also includes “Pray For Peace,” a song penned by Reba which gained popularity last year after the singer released a video for the song, and urged fans to record their own videos. Artist and songwriter Sam Hunt co-wrote the album’s title track, along with McAnally and Josh Osborne. A Target exclusive version will also feature two additional tracks, “Whatever Way It Hurts The Least” (Brandy Clark, Tommy Lee James, Josh Osborne), and “More Than Just Her Last Name” (Brandy Clark, Shane McAnally, Josh Osborne). The legendary singer recently announced she has signed on to the Nash Icon Music label, a joint venture between Big Machine Label Group and Cumulus Media.